In crafting the Affordable Care Act, lawmakers sought not only to expand coverage, but to begin to change the U.S. health care system's incentives -- to prod providers to prioritize care value over care volume. The Shared Savings Program, offering less financial risk and lower, but not insignificant, potential financial rewards. Both programs launched in 2012 with high hopes, but recent headlines have been less than positive. More than 40% of Pioneer ACOs have dropped out. Meanwhile, only 25% of MSSP ACOs earned bonus payments in their first year. There is more to the story. To find out what's really going on, American Health Line dug deeper. Medicare's Pioneer ACO program started in January 2012 with 32 organizations. CMS tasked those organizations with caring for a set population of Medicare beneficiaries and meeting financial and clinical/patient experience quality goals. If ACOs meet the goals, they share in cost savings. If they don't, they are penalized. Last year, nine ACOs dropped out and another four followed suit this year, including three last month. The program now has just 19 participants. Why Have So Many Pioneers Dropped Out? A number of Pioneer ACOs said that they left the program because although they showed improvements in a number of areas, they still faced penalties under the program. Sharp HealthCare cited that as a reason for leaving the program in August. Sharp noted that "it was at risk for a significant shared loss" in 2014, "despite meaningful reductions in readmission rates and hospital and skilled nursing utilization." Michael James -- president and CEO of Genesys PHO, which left the program last month -- said, "We improved utilization, we improved quality and we lowered our costs but we couldn't make the economic model work." While the ACO "saved Medicare more than $20 million," that was still below Medicare's target, according to James. As a result, the ACO had to absorb a loss. The volatility of performance targets, which are particularly sensitive to mortality rates, making it difficult for providers to plan ahead. The news on the Pioneer front isn't all bad, though. CMS last month announced that Pioneer ACOs in 2013 saved Medicare more than $96 million and held per capita Medicare spending growth to 1.4%, about 0.45% lower than traditional Medicare FFS. Three deferred reconciliation until the end of performance year three. In September, CMS also said that Pioneer ACOs' mean quality scores increased from 71.8% in 2012 to 85.2% in 2013. Pioneer ACOs improved in 28 of the program's 33 quality measures, including controlling high blood pressure and several patient satisfaction categories. Further, any successful and innovative population health management techniques demonstrated by the Pioneer ACOs has the chance to inspire similar efforts from other providers. Matt Horn, who directs Banner Health's Pioneer ACO program, told MedPage Today, "We see health care moving from a 'volume' world to a 'value' world, and the only way we can engage with providers and consumers is by engaging in these programs." He added that while the Pioneer ACO program is "not a perfect system ... we want to work with CMS [to improve it]." Unlike the shrinking Pioneer program, the Medicare Shared Savings Program has grown. Twenty-seven organizations originally signed on in April 2012, and there are 337 participating today, according to CMS. MSSP carries less risk for organizations than the Pioneer ACO program, allowing them to share in savings but have the option of not being on the hook for any losses until they've been in the MSSP for three years. 58 spent above the benchmark but did not spend more than their MLR. MSSP ACOs as a whole also improved on 30 of 33 quality measures, including on beneficiaries' rating of their physician and high blood pressure screening. Meanwhile, seven of the nine Pioneer ACOs that left the program last year switched to MSSP, and at least two of the Pioneers that have left in 2014 also plan to do so. Are the Medicare ACOs Improving Quality, and Defining Quality Well? While CMS has said ACOs in both programs have improved on quality, not everyone believes CMS is defining quality well. Ashish Jha, a health policy professor at Harvard, told Modern Healthcare that the quality measures "are just not very good" and don't focus enough on population health or the end results of patient treatment. He added, "We're not measuring the things that matter most. Are patients better off in an ACO? Are they healthier?" In response to those criticisms, CMS has proposed increasing the number of quality reporting metrics for both programs from 33 to 37 and swapping out a few old measures for new ones to focus more on patient outcomes. Although many of the recent headlines focused on how just 25% of ACOs earned bonus payments, more than 50% of all the Medicare ACOs have held spending at or below targets. In addition, other ACOs reduced spending generally, even if it did not meet CMS' benchmark targets. Meanwhile, it appears that CMS might need to further tweak the Pioneer and MSSP financial models to keep organizations participating. However, CMS already has begun to add some additional flexibility to the Pioneer program, including waiving its three-day hospitalization rule for admitting patients to skilled nursing facilities, and two Pioneer ACOs also have opted to receive a monthly population-based payment in place of place of some fee-for-service payments, with more Pioneers expected to take up that option in future years. We'll have to wait and see if the new elements entice the remaining nine Pioneers to stay on in the coming years. 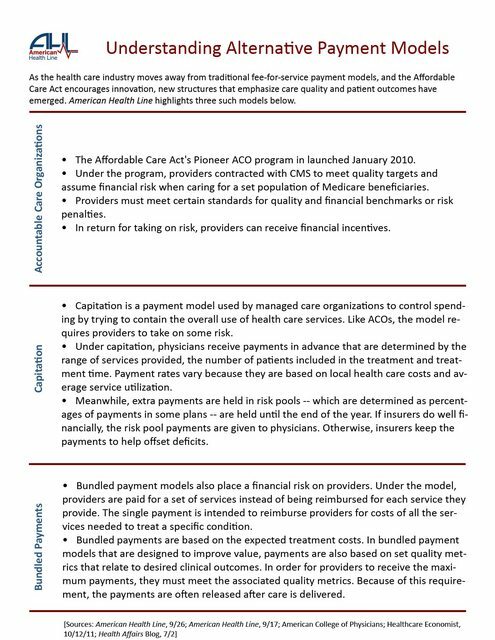 Meanwhile, the real test of whether the financial setup of MSSP can work will come once ACOs have been in the program for three years and then must decide whether to continue -- with the potential financial risk that would entail -- or leave the program. How Should Medicare ACOs Be Judged? Lost in all the headlines about Pioneers dropping out and few ACOs receiving bonuses, it's important to remember the real goal of these programs: Changing providers' incentives to create positive changes in the U.S. health care system. Are they improving quality -- and measuring quality well? Are they reducing costs relative to traditional, fee-for-service Medicare? Are they setting an example that would encourage state Medicaid programs and private payers to experiment with ACO-like models? Are they inspiring providers to create care networks and innovative ways of better delivering care? So far, the programs have shown some promise in these areas, and plenty of room for improvement. The answers to these questions are several years off, but they will go a long way toward determining how much the ACA has delivered on its goals of increasing quality and holding down costs. As the health care industry moves away from traditional fee-for-service payment models, and the Affordable Care Act encourages innovation, new structures that emphasize care quality and patient outcomes have emerged. 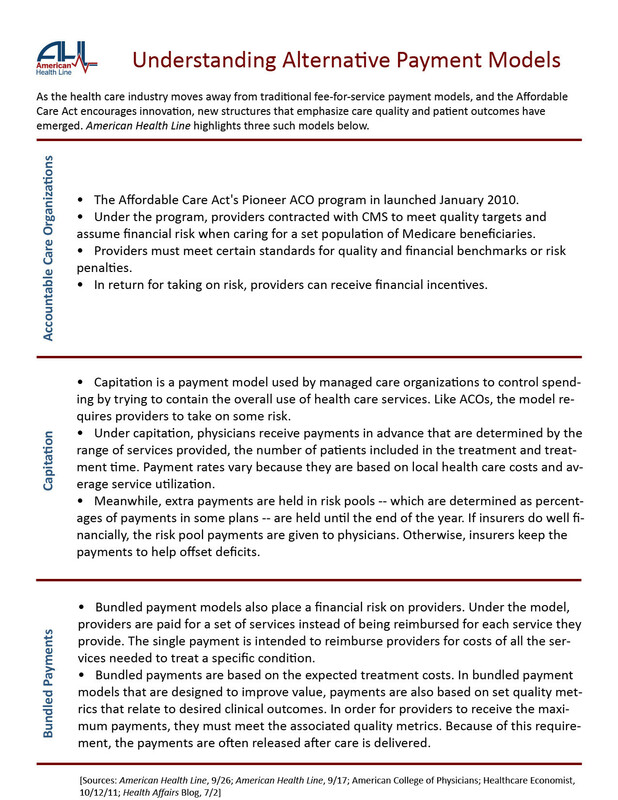 American Health Line highlights three such models below.